Father. Husband. Son. Baptist Minister. Nobel Peace Prize Winner. Social Reformer. Civil Rights Activist. And 50 years ago today Martin Luther King Jr. was assassinated in Memphis Tennessee. #1 - His final resting place hasn't been so restful. It's been moved 3 times. He's technically in his third grave. Here's a list of his moves. On April 9th, 1968, five days after his assasination, he was buried at the Southview Cemetery in Atlanta, Georgia. 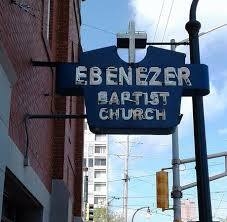 In 1970, his wife Coretta Scott King moved him next to Ebenezer Baptist Church nearby where she established and built the King Center. Martin Luther King Jr. and his father were both ministers at the church. In 1977, he was moved to a marble crypt at the King Center, now known as the Martin Luther King Jr. National Historical Park in Atlanta, Georgia. # 2 - He had two funerals and was pulled by two mules. The first funeral service held in the morning was for family, friends and distinguished guests only at Ebenezer Baptist Church which held about 1200 people. After the first service, his casket was put onto a wooden farm wagon and pulled at the front of his funeral procession by two mules. The procession walked three-and-a-half miles through Atlanta to Morehouse College where the second service was held in the public quad. #3 - He was buried alone, but now he has eternal company. In January 2006 his wife Corretta Scott King died due to complications from ovarian cancer. Per her wishes, she was laid to rest next to him. The new mausoleum containing both the bodies of Dr. and Mrs. King was unveiled in November 2006. #4 - The name on his crypt, was not the name he was born with. Martin Luther King Jr. was actually born "Michael" King on January 15, 1929. You can read more about his name change in my previous blog post here. #5 - Actor Samuel L. Jackson was an usher at his funeral. We all know Reverend Jesse Jackson, just 26 years old at the time was also present that fateful day Martin Luther King Jr. was assassinated. You can read about his reflections on those events 50 years ago here. But did you know Hollywood actor Samuel L. Jackson shares a connection as well? He was a student at Morehouse College in Atlanta at the time of Martin Luther King Jr.'s assassination and involved in the civil rights movement. Though he never met Martin Luther King Jr., the tragic event inspired him to become more involved. And he was an usher at Dr. King’s funeral. Read more in his own words about the experience here. Want to know more about Martin Luther King Jr.? Click on the links below and read on.